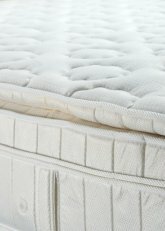 How Popular Are Serta Mattresses? Serta mattress reviews are a helpful tool in deciding whether you want to purchase this popular brand of mattress. What are the best rated Serta mattresses, and what are the top complaints? Serta has been in the mattress manufacturing business for over 75 years and has a significant share in the mattress market, especially when it comes to comfort and affordability. Serta mattresses are actually considered a brand of mattress that delivers value and comfort without breaking the bank. They've priced their mattresses competitively in comparison to Simmons and Sealy, two other top name brand mattress manufacturers. The company now known as Serta began in 1931 as the Original Guardian Knight Sleeper Products, Inc. The company consisted of 13 mattress manufacturers coming together to share knowledge and expertise. The same year these manufacturers came together to form one business, they produced the first tuftless mattress ever. By 1940, the company name was Serta, Inc. As a company, they have consistently designed and manufactured new and innovative mattress styles. They often set the standard for other mattresses manufacturers. Today, Serta boasts 59 manufacturing locations which service over 60 countries worldwide. This product line features Serta's most advanced support technology yet. It's called the Flex Free 3D. This mattress also features Pillow Soft Coil technology and Cool Nature Comfort Quilt Plus technology. Cutting edge temperature controlling materials are combined to create a sleeping surface that ensures you won't be too hot or too cold when sleeping. This design by Serta is supported by medical research. Consumer reviews of the Serta Perfect Day are not as good as some of their other models, with a slightly below average owner satisfaction overall, not great but not bad. The benefits customers report are little offgassing, comfortable sleeping temperatures, and no flipping of the mattress is required. Many customers were unhappy with the customer support. It is one of the heaviest Serta mattresses so it is difficult to move. Sertapedic is the product line by Serta that offers quality and comfort, but with a slightly lower price tag. The company says that this innerspring style mattress with advanced comfort feature options like latex foam or memory foam is heads and tails above comparable value-priced innerspring mattresses. This model is sometimes used as an extra bed and so is not slept on every night, however consumer reviews indicate that it is not a very durable bed, just lasting a few years at the most. People like the lower price tag however are unhappy with the short lifespan of this product. It is available in just a medium or firm mattress style, which is more difficult for side sleepers. Additionally, the cheaper design of this bed has some limitations, so if you sleep with a partner you are more likely to wake when they move, as the mattress does not isolate the motion like other types of mattresses. The Serta Perfect Sleeper is one of the best selling mattresses in the United States. Each mattress in this product line offers the patented Cool Nature Comfort Quilt Plus sleeping surface so you'll enjoy the most comfortable temperatures while sleeping. The Perfect Sleeper is considered an good value for the quality received. Consumer's Digest rates it as a Best Buy for consumers, although it has many of the same consumer complaints that the Sertapedic and Perfect Day mattresses, namely limited durability, premature sagging and dissatisfaction with the warranty and customer service. The Serta Perfect Sleeper is available in more of a variety of firmnesses that some of the other Serta models. Serta teamed up with renowned designer Vera Wang to produce specialty mattresses featuring all the latest in foam technology and traditional mattresses that are not only comfortable, but also designed beautifully with luxurious fabrics. Reviews of the Serta Vera Wang mattresses that we found were not stellar, and significantly below the average of other Serta mattress reviews we found. Although you can still find Serta Vera Wang mattresses online, it appears that Serta is no longer producing this line. The main complaints we found for the Vera Wang mattress were sagging and body indentations, and a very high price tag. Many customers spoke in very colorful terms about the huge hole that developed in their bed after just a short time. Overall owner dissatisfaction was much higher for those who bought the Vera Wang latex mattresses, than among those who purchased the innerspring models. People who owned the Vera Wang mattress were overall happy with the motion isolation of the bed, which means that if you sleep with a partner you are less likely to be disturbed when they move. The bed is also quieter than many of the other Serta models. Serta mattress reviews of the Vera Wang mattresses received more complaints about outgassing and chemical odors than the previously mentioned models. Serta has jumped into the memory foam mattress arena, offering some features that hope to address people's main complaints about memory foam, which is that it creates too much heat. They have remedied this problem with the addition of a cooling gel that is said to reduce the tendency of the mattress to create excess heat. In addition they have created an antimicrobial and dust mite resistant mattress that reduces allergy symptoms, as long as you are not sensitive to the chemicals in the memory foam. Please see our Memory Foam Mattress concerns page for more about this. Another feature of the Serta iComfort mattress is the option for an adjustable platform that allows you to recline in various positions by using a wireless remote that moves the head or foot of the mattress. The iComfort mattresses are well rated by customers, somewhat better than their other models of innerspring and foam mattresses, however not as high as the Temmpurpedic mattress or other popular memory foam brands. Serta mattress reviews of the iComfort indicate that customers appreciate the more affordable pricing, compared to other brands of memory foam, and a solid 25 year warranties, as well as enjoyment of the other benefits of memory foam such as pain relief, motion isolation, and a quiet mattress that does not make noise like innerspring mattresses. The main problem that iComfort owners faced was the offgassing odor of memory foam, and that the mattress still sleeps hot even with the cooling gel, and is very heavy to move. These are all-foam mattresses using Talalay Latex, which is the most advanced, comfortable, and breathable foam available on the market. Consumers with allergies may want to consider latex mattresses because they're hypoallergenic and naturally resistant to dust mites. There weren't a lot of Serta mattress reviews available for the Pure Response brand, but the ones we found indicated that customers found them comfortable and appreciated the 30 year warranty, but that some models were a bit too firm. The Pure Response is no longer available on the Serta website but you may be able to find them at online retailers. This is an earlier model of Serta memory foam mattress that is no longer manufactured, although you may still be able to find these online. This product line featured Smart Fabric Technology(tm), which helps ensure a comfortable temperature while sleeping. The Serta True Response memory foam offered all the benefits of memory foam at a lower price than many other memory foam brands. Many Serta mattress reviews speak very highly of Serta Pillow Top mattresses. These were the ones consumers rated most often and the comments they made were overwhelmingly positive for comfort, support, and quality for the price. The Serta Perfect Sleeper was another one consumers seem to like a lot and the one that is rated as the number one choice of mattress in the U.S.
No one Serta mattress stood out from the others for having the most negative consumer reviews. The positive and negative comments in Serta mattress reviews seem to be somewhat divided, although you see the same positive comments repeated about comfort and support over and over. On the flip side, negative Serta mattress reviews mention often that the mattresses sag a lot within a short period of time and that warranty issues and customer service were not always what was hoped for. Such a great night's sleep! I'm asleep within seconds of lying down! I enjoy sleeping in now! One of the best ways to ensure that your Serta mattress warranty will remain active for the life of your mattress is to take good care of it. It's important to match your mattress with the proper box spring. A firm foundation is a must as well for optimal comfort. Try not to bend your mattress or else you could damage in the innersprings. Allow your mattress to air out for a few days when you first receive it. Protect your mattress with a mattress pad, or a full mattress protector. Vacuum your mattress at least one time every 12 months. Don't tear off the tag! It includes vital warranty information, just in case. Mostly the warranty covers normal wear and tear, but has specific guidelines for return and exchange. Always ask about these details prior to purchase. Where Can I Buy a Serta? You can find Serta brand mattresses in both retail stores or with online retailers. Always take the time to read Serta mattress reviews before making a purchase. Do you have a Serta mattress? Would you recommend it to others? Please share your experience!